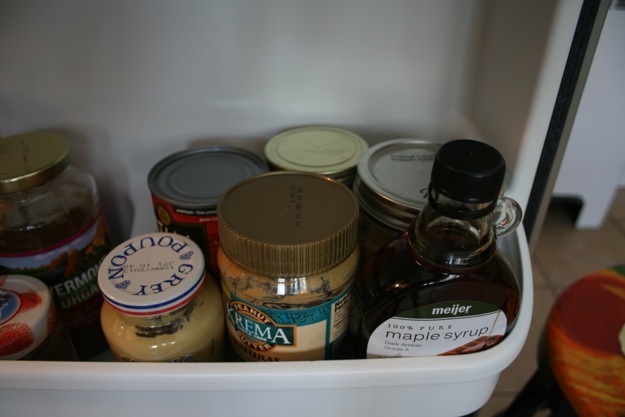 Most refrigerators are the centers of our kitchens. They hold everything and anything we need to eat and drink in the future. 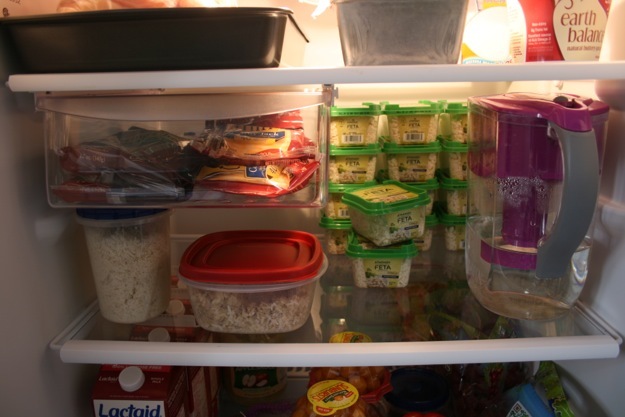 Whether your fridge is full of organic fruits and vegetables or pizza leftovers, it is still a crucial part of the kitchen.  Most people like to keep the contents of their fridge neatly tucked away, but I thought I’d give all of you a peak inside Team VP’s icebox. When I took these photographs we were preparing for the week so we had meat on the top shelf that was waiting to be cooked. 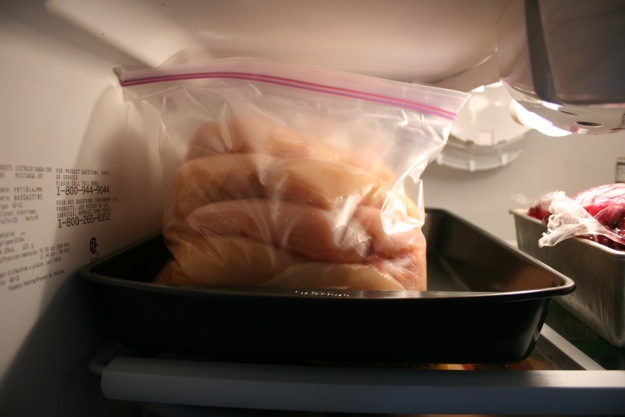 When I get home from the supermarket I process any meat we purchase and then place it in a resealable bag or container. This week we are having boneless skinless chicken breast during the week for lunch and dinner in 3 to 4 ounce portions. We also had rosemary leg of lamb in the slow cooker. I placed the lamb in its original packaging in a bread tin because I was concerned I would end up with lamb juice all over my fridge. 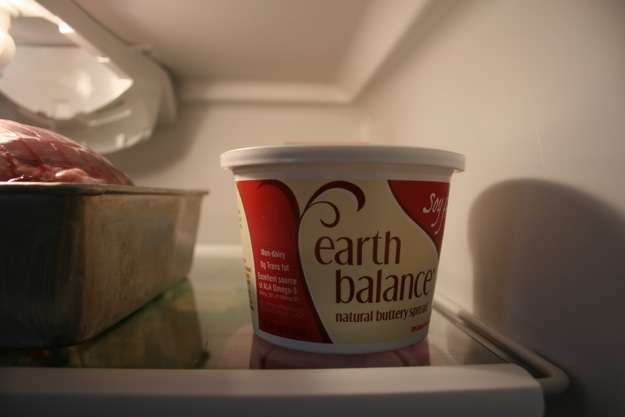 This Earth Balance soy free spread floats around the refrigerator and just happened to be on the top shelf when I was taking photos. It is vegan, soy free, lactose free and gluten free. I can easily cook with it or use it on toast. For a non-dairy substitute it is pretty good. 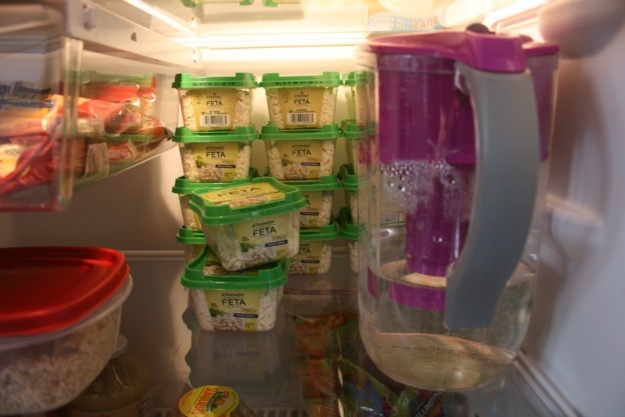 The next shelf down holds the key to all the feta cheese in the state of Michigan. Mr. MVP can have feta cheese because FODMAPers are allowed certain cheeses with zero sugar. Feta is expensive, but Meijer has amazing sales, and feta keeps for months, so when Meijer has a sale we buy at least two cases. This feta will last us through the spring. The Brita pitcher is a must in our house. We drink a lot of water, so the Brita pitcher is constantly being filled. 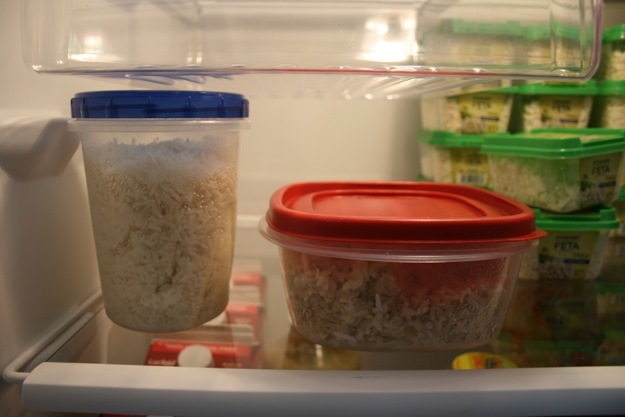 We always have two types of rice in our refrigerator: organic white and California organic brown. We use a Zojirushi rice cooker and rice has become a staple in our diet. We buy our rice from the Food Co-op where it is half as expensive and we have three times the selection and quality. 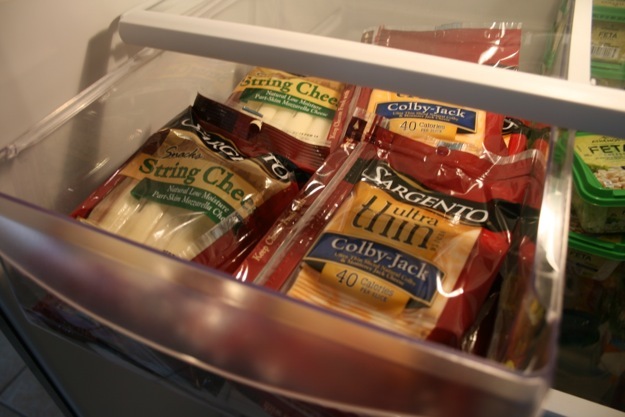 Although Mr. MVP sticks to his feta cheese I prefer colby-jack and string cheese. 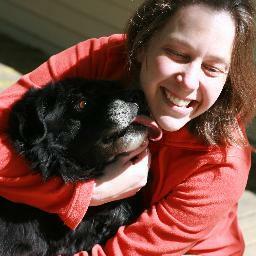 I’ve found that Sargento makes a really good preservative free cheese. 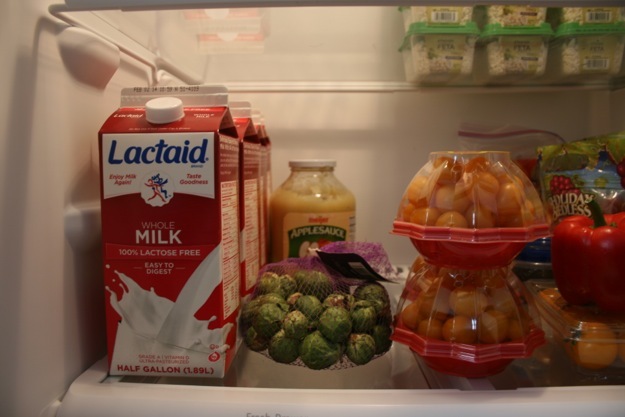 On the bottom shelf we keep our milk that is safe for both Mr. MVP and me. We drink whole milk, only. We also like Meijer brand unsweetened applesauce. The ingredients are apples. This applesauce tastes delicious in oatmeal, but I also use it as a butter substitute when baking. We also have a bag of brussels sprouts. I’m going to roast them in the oven later in the week. The yellow tomatoes will go in Mr. MVP’s lunches. He eats about six to eight tomatoes along with a 1/2 cup of rice and 4 ounces of chicken. The red pepper and the larger yellow tomatoes I will probably roast along with the sprouts for dinner later on in the week. The grapes are seedless and I have at least one cup as a snack with cheese every night. 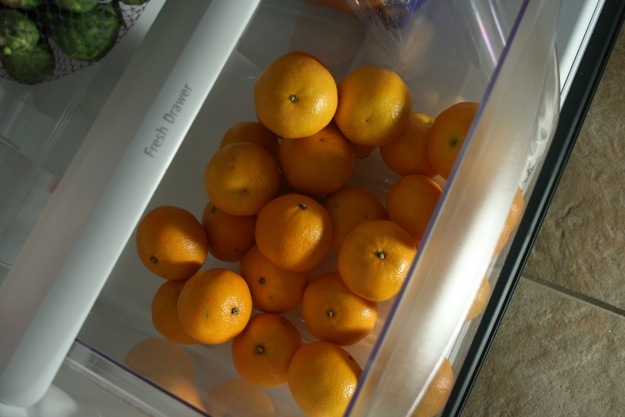 In one produce drawer Mr. MVP keeps his clementines. 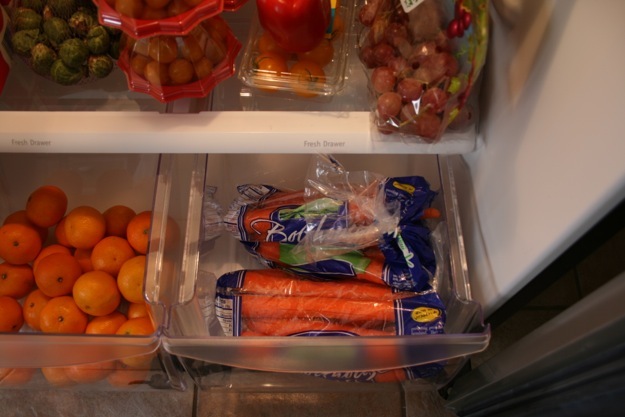 While in the other we keep the carrots for Mr. MVP’s lunches and Blue-Bird’s snacks. In the door we have rosemary for the lamb. 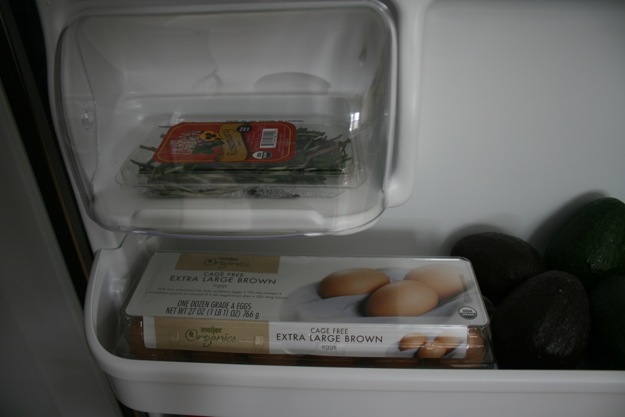 Then we have extra large cage free brown eggs. I think I’m going to bake half of the eggs in the oven so we have some hard boiled eggs and then leave the rest for baking next week. The other half of the top shelf of the door is filled with avocados. Honestly, these are only half of the avocados we have. 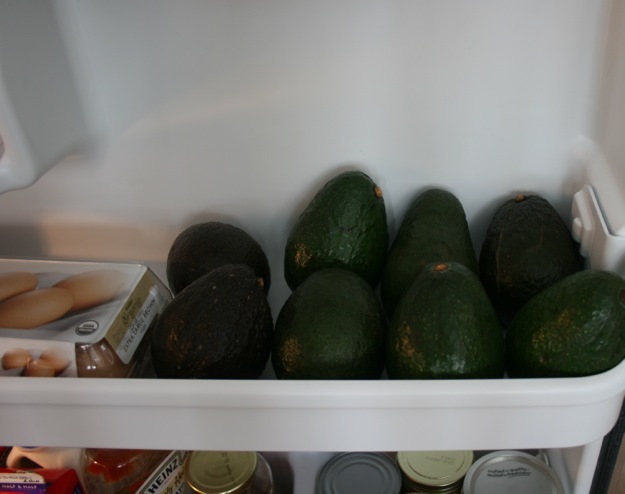 Once an avocado gets ripe we stick it in the fridge to stop it from getting too ripe to eat. We eat, on average 10 avocados each week. 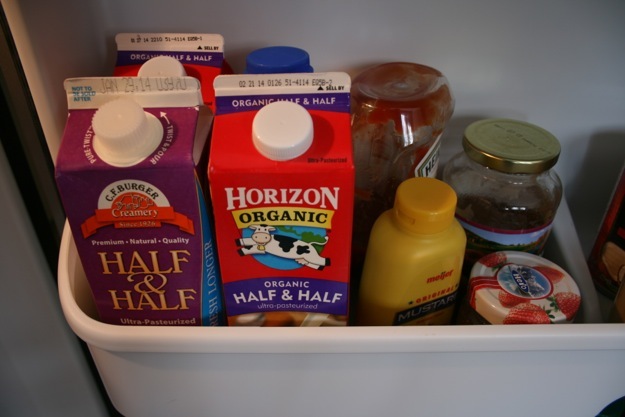 The middle shelf in the door has my half and half. I use this in my coffee. There are three different brands because I buy which ever is on sale, but I’m careful to only buy the labels that contain milk and cream. Next to my dairy collect is the Meijer mustard which contains no FODMAP ingredients, Heinz simply ketchup, my Vermont Organics blueberry applesauce, and the strawberry preserves. Across the way from the dairy we keep the Krema peanut butter, the maple syrup, the dijon mustard, the almond butter and the coconut. In the bottom shelf we keep the juice. 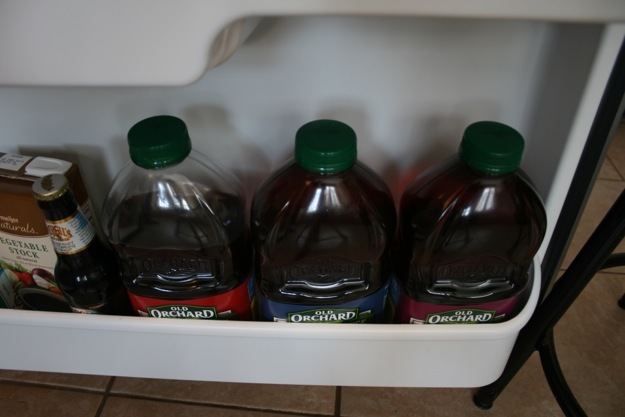 We have an affection for Old Orchard juice. We’ve found that they are one of the only juices that do not add any sugar or preservatives. As a bonus Mr. MVP can handle an 8 ounce serving just fine, even with his FODMAP diet. The flavors in our fridge right now are berry, cranberry and cherry. 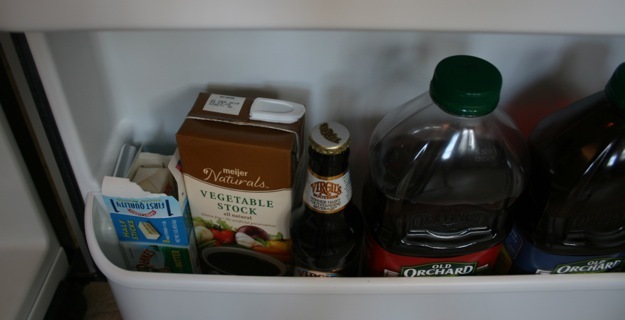 In the corner of the door are a bottle of Virgil’s root beer, which we use for pulled pork, Meijer Naturals vegetable stock, which I use for cooking and tucked away in the corner is one cup of butter that I keep on hand for me. I am not dairy free and every so often I need butter for something or other. 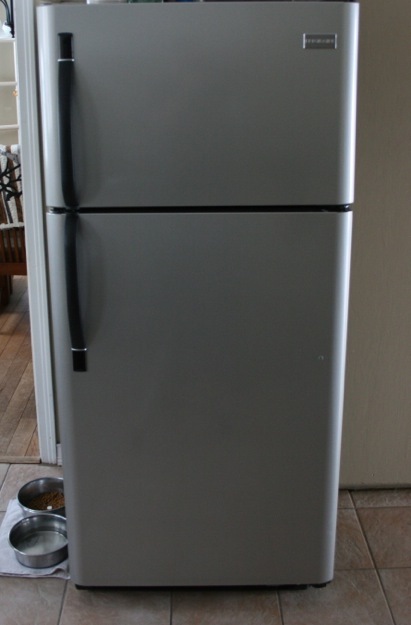 So that is our refrigerator from top to bottom. It is constantly changing, however. By the time you read this, the chicken will be cooked and Mr. MVP’s lunches will be stacked neatly on the second shelf. One bag of grapes will be gone and the yellow tomatoes will be portioned out into containers. 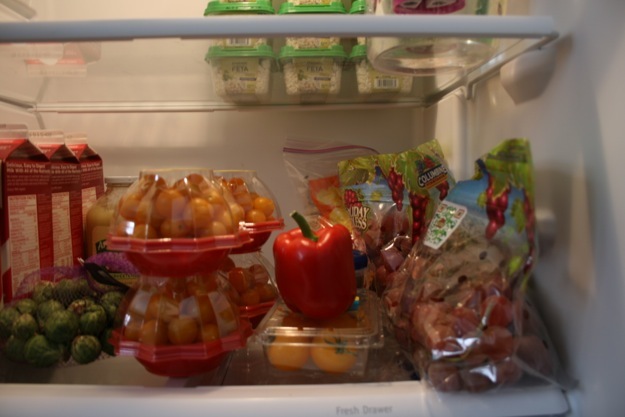 Our fridge is efficient and full of healthy and smart foods, ready at any time. 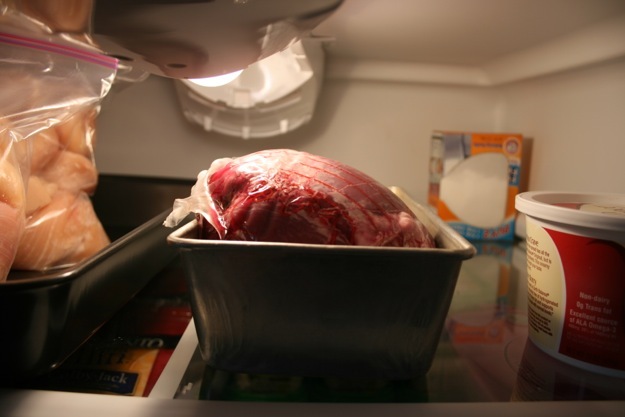 What does the inside of your refrigerator look like?